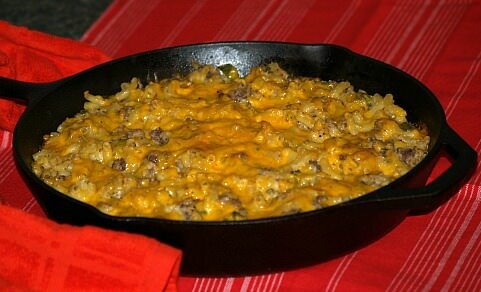 If you know how to make a chili casserole recipe, you will know it is almost as popular as a pot of chili. What is now one of the most popular dishes in the world with festivals celebrated its great name throughout the year; chili has many legends and stories about its origin. There are different versions as who created the first chili recipe but it seems to have been traced back to some of the poorest of people. This is exactly what I try to stress in this website; you don’t have to be rich to eat good because some of the best foods are the basic simple and often the cheapest foods. When I learned how to make a chili casserole recipe, I described it as being very closely related to chili recipes; like a “kissing cousin”. 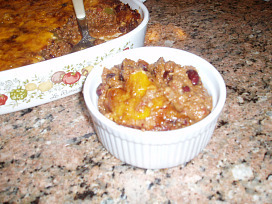 Like chili, the casseroles can have a variety of different ingredients and seasonings, they provide a hearty meal in one dish or “pot “and they are very flavorful. The one slightly difference is that the casseroles are baked to be thicker or drier even though some chilies are thick too. However you like your chili, don’t pass up learning how to make chili casserole recipes. I love these dishes especially when they are spicy with hot peppers and lots of cheese. They are delicious served with tortilla chips. They are so filling that you need nothing else to make a meal. Grease a 12 inch casserole baking dish. Combine the flour, baking powder, ½ cup of the shredded cheese and salt in a bowl. Stir in the egg and milk and mix well. Spread over the bottom of the greased casserole dish. Cook the ground beef, onion and bell pepper until beef is done. Remove from heat. Add in the beans, tomato sauce, chili powder, garlic powder and oregano. Stir in ½ cup of the shredded cheese. Spoon over the dough in the casserole dish. Top with remaining ½ cup of shredded cheese. Bake for 25 to 30 minutes. Let set 10 to 15 minutes before cutting and serving. Grease a casserole baking dish. 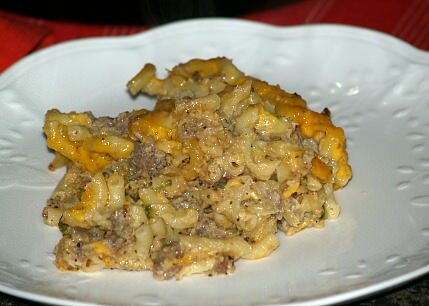 Mix together the cooked sausage, cooked macaroni, green chilies, sour cream, salt and 1 ½ cups of the shredded cheese. Spoon into the casserole dish. Top with remaining ½ cup of shredded cheese and the croutons. Bake uncovered for 25 minutes. 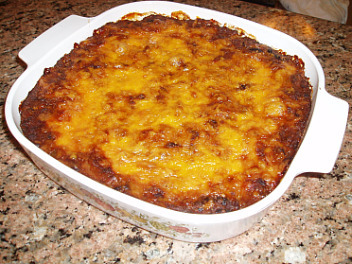 MEXICAN LASAGNA RECIPE This Mexican lasagna recipe has some of the basic ingredients that chili casseroles have. Brown meat in skillet and drain; add corn, tomato sauce, picante sauce, chili powder and cumin. Bring mixture to boil, reduce heat and simmer stirring frequently for 5 minutes. Combine cottage cheese, eggs, Parmesan cheese, oregano and garlic salt; blend well. Arrange 6 tortillas on bottom of greased 9 X 13 inch baking dish overlapping as necessary. Top tortillas with half of meat mixture; spoon cheese mixture over the meat mixture. Arrange remaining tortillas over the cheese overlapping as needed. Top with remaining half of meat mixture; bake for 30 minutes or until hot and bubbly. Remove from oven a sprinkle top with Cheddar cheese; let stand 10 minutes. Chili casseroles and taco casseroles are very close in the taste. Cook beef in skillet until brown; drain. Stir in beans, tomato sauce, taco sauce, chili powder and garlic powder. Bring mixture to boil stirring occasionally. Place tortilla chips in ungreased 2 quart casserole dish. Top with beef mixture; spread with sour cream. Sprinkle over sour cream the onions, tomatoes and cheese. Bake uncovered for 20 to 30 minutes or until bubbly. Arrange additional chips around casserole dish; serve with shredded lettuce, chili peppers and taco sauce.